With Williams’ return more effective, she manufactured a second break point in the game by finding a backhand down the line winner. By connecting on a forehand volley winner, Williams captured the break for 5-4. Then, with an outstanding service game, Williams pocketed the first set. From that point on, Williams raced to the finish, trying to finish prior to the projected storm. By pushing Stosur into a backhand miscue, Williams had double break point to begin the second set. Although Stosur got to deuce, Williams fabricated a third break point. With a forehand crosscourt winner, Williams had the break and easily consolidated. Her next time out, Stosur fought off break point but held for 1-2. Yet, with another love game, Williams stretched her lead to 3-1. Because of bevy of mistakes by Stosur, Williams had again double break point. 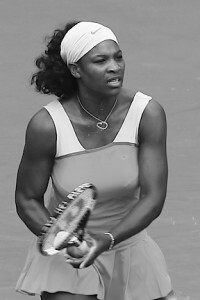 When Stosur’s forehand failed her, Williams had a near insurmountable advantage of 4-1. Serving for the match, Williams committed a forehand error to face her first break point of the day. Still, she quickly recovered with an ace. Next, with Stosur’s forehand traveling long, Williams had match point. By thumping an ace, Williams placed an exclamation mark on her performance and claimed the championship. Williams last hoisted this trophy ten years ago, and last collected back to back titles in 2008. Williams is thrilled that she has been doing so well after her medical issues stating “I am happy to be here. . .I keep having fun”. When asked whether she expected to be at such a level so soon, Williams responded “I like to do the impossible”. With the victory today, Williams’ ranking will move from 80 into the top 30. Williams also conceded that her objective is to be seeded at the U.S. Open. In a couple of days, Williams will compete in Cincinnati. With good results there, she will meet her goal of being in the top 32 in New York.